July Relaxer/Hair Update + Castor Oil Challenge Regimen - Hairlicious Inc.
OMG, you are waist length! I've followed you for 2 years and that's my first comment. I like your hair, your thickness, your lenght, you are my inspiration since the begginning. Thanks for all. Please let your hair grow because it looks beautiful and healthy. Excuse my english (I speack french). Good to have you back blogging. Have missed your blogging over the summer. First of all, I want to say a big thank you for using your knowledge to help and bless the rest of us. I appreciate it. I have one question though. I notice "seal my ends" in your hair regimen a lot for the above challenge and I was wondering if you can explain what it means and how to do it on a daily basis outside of a hair challenge. Texture is too good and i think it is most important rather than the length. Personally i prefer healthy and good texture rather than length. Very beautiful hair and love weekly tips you have shared here. Thank you ladies for your comments. I'm flattered by your compliments and I'm honored to be considered an inspiration. Thank you for taking the time to visit and read my blog. @Kimmy babe - "Sealing" the ends is basically applying a natural oil to your ends after you've moisturized your ends. The oil helps to trap in the moisture so that your hair will remain hydrated, thus preventing breakage. @ Anonymous - Yes, I am still using Scurl in my regimen. Sunshyne do you do a protein treatment every week? (Monday according to the regimen again). What could I do for my hair if I am not able to wash it weekly but every other week with the deep conditioning, will that still be effective? Even though I moisturize &' seal daily will my hair still grow? I know Im late on the challenge. I plan to start as soon as I finish my six month stretch. I think Im going to try your same regimen. Your hair looks awesome! Hi Sunshyne,how do you air dry? Whenever I airdry my hair turns out very dry,what can I do to prevent that dryness when air drying? @Anonymous1- Yes. I still do my protein treatments once a week. I aim for Monday's, however, sometimes things get a little too hectic that I push it to another day. Either way, I do it once a week. @Anonymous2- Yes, even if you do the basics i.e. moisturize and seal daily, wash and deep condition at least twice a month, your hair will still grow and you can retain length. However, the more you wash your hair and treat it, the better. @Anonymous4- I air dry either in a bun or with it hanging down. 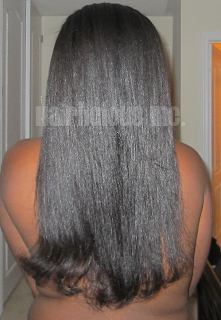 I usually blow dry on cool air to close the cuticles and promote shine in the hair. I have a video on it, just search "Hairlicious how I air dry my hair" on my blog. To prevent dryness, I suggest you seal your leave-in with a light oil (coconut oil, grapeseed oil) and bun the hair afterward or blow dry on cool air. It helps prevent frizz too. Hope that helps. Does castor oil make your hair thicker or does it grow it longer? I have problems with my ends always getting tangled and don't know if castor oil will help. Looks like I am going to have to cut about an inch off and try to see if that would help. Which protein treatment do you use once a week? @Kay-I use Aphogee 2min Reconstructor weekly.